This sign is for Alemite Specialized Lubrication. The sign’s colors are blue, red, and yellow. 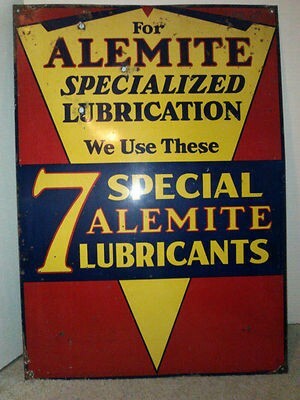 The text on the sign reads: For Alemite specialized lubrication We use these 7 special alemite lubricants. The sign shows text and a yellow diamond shape.